Self-taught and hobbyist photographer, my photographic journey began with astronomy in 1992. After a few years spending nights to shoot, I moved from the infinitely big to the infinitesimally small using macrophotography. 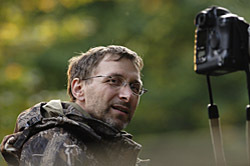 My passion for pictures was becoming established and since there I’ve been discovering the animal world surrounding us. Photography allows us to capture that one exact and often brief moment, that you are sharing with the animal world, and even if you don’t always manage to do well, the picture you keep in your memories is worth the pain of those long hours waiting for the animals to come. Like every beginners, I’ve favored the technical aspects for a long time, instead of focusing on the field, the species and the spontaneity. With hindsight, I can assume that even if the device used is important to successfully capture an animal, this one would never stand in for the knowledge of the natural environment.